The Noon Class: Hatha Yoga for Everyone: Suitable for all ages and abilities, this class offers a slow mindful pace with plenty of time to steep in the postures. A gradual warm up with breath work is followed by stronger poses that can be modified to suit any level. A gentle cool-down and relaxation conclude each class. Please bring a blanket for support. 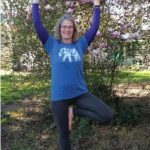 Ann Constantino has taught yoga in Southern Humboldt since 2005. She has been specializing in restorative yoga since 2015. The joy of yoga is in its ability to foster self-knowledge and exploration that helps the practitioner feel more connected to the life force shared by all beings.